With Yuki’s Timesheet module, you can automate the process of writing down and billing your work hours. The module is fully integrated with Yuki. Always up-to-date insight into the time spent per client or project and thus even more control over the debtor management. 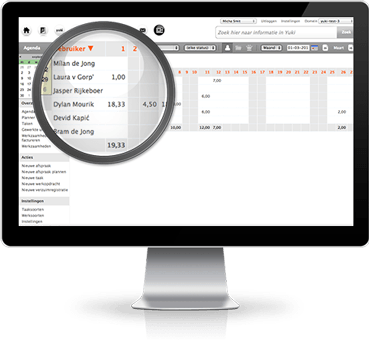 Yuki Timesheets is suitable for any entrepreneur or company that offers hourly or daily basis services and invoices these to customers. Create work types (interior services and rates). Register hours for a work assignment by relationship or project. Look at the proposal of declaration of activities. You can view weekly and monthly summaries of registered hours. In this way, you have a quick insight into the booked hours per employee, project and client. Each period, you can rate work performed per client or file and, if necessary, modify and approve. 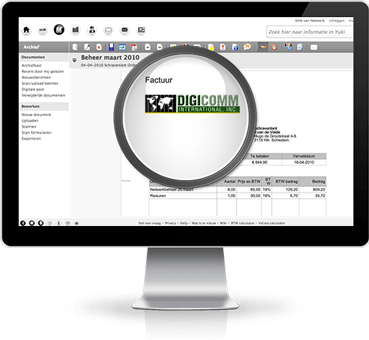 Invoices are then automatically created and linked to the relationship. Now you can quickly send the bills and they are directly in your bookkeeping. To create and approve billable hours, you can set a workflow yourself that fits your business. So you can easily delegate matters to workers who may write and approve hours. You can bill your services in your own house style. Namely, in Yuki’s invoice module you can directly work with different invoice layouts. You can also employ your own stationery background in your invoices. For each customer, you can set whether the invoice should be sent by post or by email. You can choose to send a specification of the performed activities. You can try Yuki Timesheets for free for a whole month. If you don’t like it, then simply turn off the service again so you will pay nothing. If you continue using the service after that month, Yuki will charge you €10.00 per month for the additional software as fixed costs.